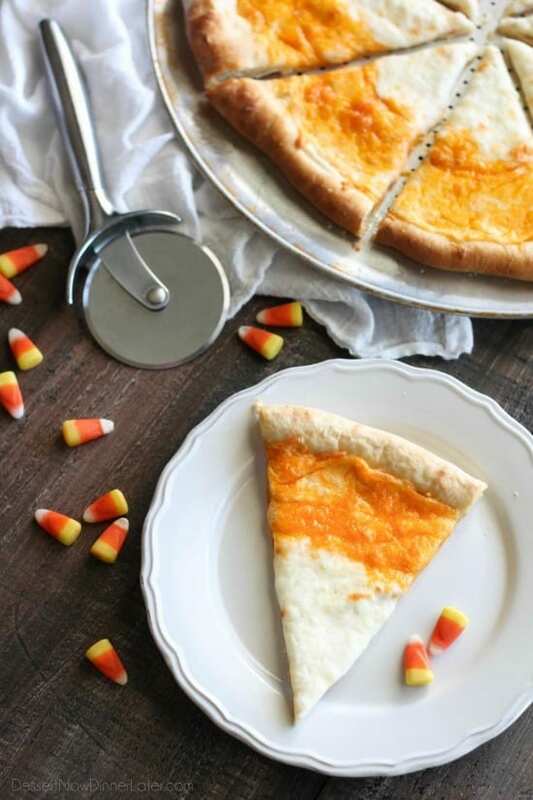 Candy Corn Pizza - Dessert Now, Dinner Later! 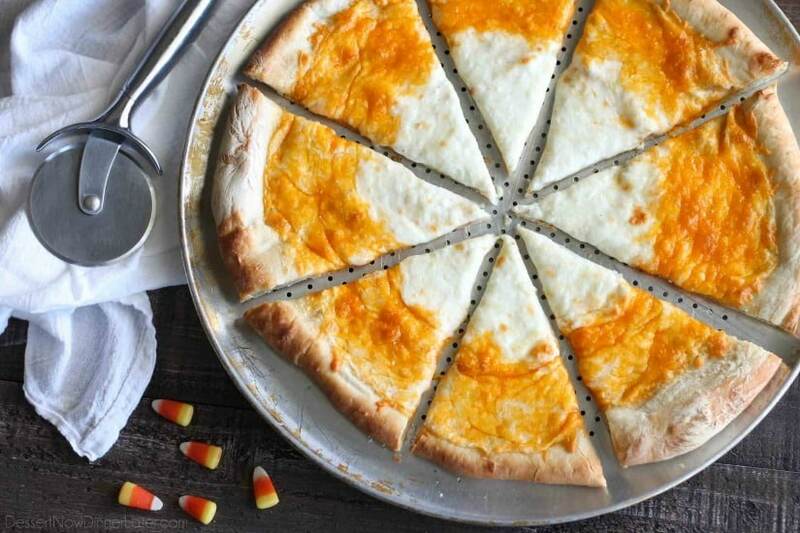 Candy Corn Pizza is a fun and easy idea for Halloween dinner — even the kids can make it! It’s that time of year! The stores are full of Halloween costumes and spooky decorations and my kids are trying to decide what they want to be. This is an ongoing conversation that actually happens year-round at our house. It basically starts the minute trick-or-treating is over on Halloween night and continues for the next 365 days until the following Halloween comes. To say my kids love Halloween is an understatement. We have moved twice since last Halloween. About 70 miles north of our last town. We lived in an apartment and then moved into a house we had built for us, and this is the first Halloween in our new town. We live in a cul-de-sac that is still being developed and my kids think we’re going to get lots of trick-or-treaters. Probably not, at least this year, but they can dream right? We usually go trick-or-treating together for an hour between 6 & 7pm. My kids wear out quickly, and we usually have plenty of candy by then anyways. Then we stay home and I let the kids help pass out candy. It’s a fun tradition. Some other traditions we’ve had in the past before our move, was to go to the local cupcake shop and get free cupcakes, go to Sonic and get fifty cent corn dogs, and go to Jamba Juice for $1 smoothies. 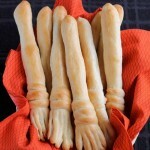 We almost always have pizza for dinner on Halloween night because it’s easy, and everyone loves it. 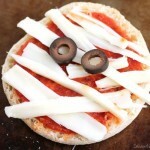 Last year’s pizza ended up being these Mini Mummy Pizzas, but I have a new pizza up my sleeve for this year. 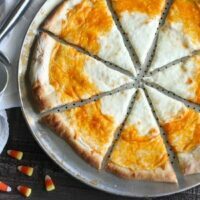 This candy corn pizza is so simple and makes the whole family happy. Less fighting about dinner means we can leave to go trick-or-treating that much sooner. Win-win! The best part is that you don’t have to make the dough, but you still get that fresh, homemade pizza taste because you are using frozen dough. We pull one loaf out of the freezer and put in in the fridge and wrap it on the pizza pan overnight, then it’s easy to use for dinner the next day. 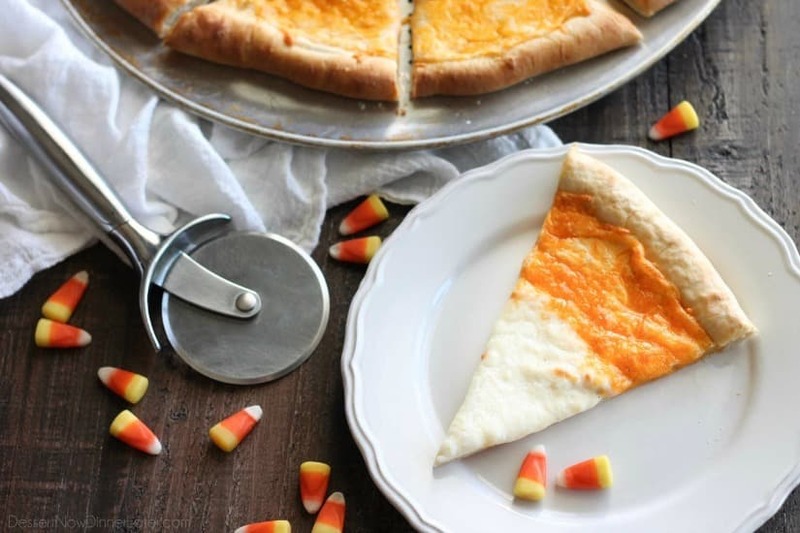 You’re going to love this candy corn pizza for Halloween dinner! 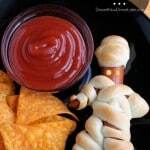 Roll out the thawed dough onto a greased pizza pan in the shape of a large circle. Pre-bake the pizza dough for 5 minutes (this ensures a crispy crust). Remove from oven and spread white sauce evenly over the dough, leaving a 1-inch rim around the pizza for the crust. 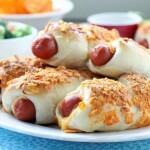 Sprinkle the sauce with some garlic salt, if desired. Sprinkle the mozzarella cheese in a circle in the middle of the pizza. 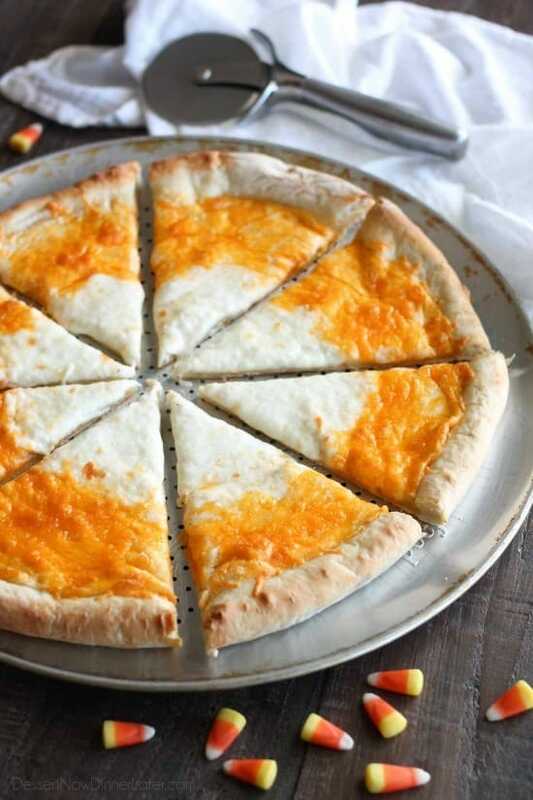 Then sprinkle the cheddar cheese around the mozzarella to make the pizza look like a bullseye. Return the pizza to the oven and bake for an additional 12 minutes, or until the center bubbles and the crust is brown. Slice and serve! What a great idea and so easy! Thanks!